Facing where this tree once grew is a den (dell) which was, long ago, laid out with paths from a mansion above. One path led to the Cauldron Linn, but all the paths were overgrown and the den itself almost impenetrable – which was an additional attraction for the roaming schoolboy. The roof had already been taken off the mansion when I discovered the den sometime soon after WW2. The banks below the ruin into the dell were an amazing spread of snowdrops, ‘millions of them’ as I reported once home and then dragged mother to ‘come and see’. We took some home and they still thrive, as snowdrops do, lining the path up to the front door. We called the place Snowdrop Valley and shared its location with very few other people. It was a very special secret place. Nosing about the half-ruined mansion at the end of one snowdrop season I found a very puzzling flower. The flower itself was rather like a snowdrop but the leaves were like big daffodil leaves, while the bulb was more like that of a hyacinth. Baffled, I took one round the village to show it to anyone who might recognise the flower. Nobody did. I was even accused on one occasion of creating a leg-pull. In despair I sent it to the Royal Botanic Garden in Edinburgh. They replied that it was a Summer Snowflake, Leucoium aestivum, which was once popular in Victorian gardens but had dropped out of favour. There is a smaller Spring Snowflake as well, Leucoium vernum and both are enjoying a renewed popularity sixty years on from my discovery. But it was the snowdrops that became my passion and every spring I’d make a pilgrimage to Snowdrop Valley to see the spectacle. There’s nothing like a woodland alight with snowdrops to make the heart lift. There is a folk story about snowdrops. When Adam and Eve were expelled from the Garden of Eden they found a world of winter desolation. Seeing Eve weeping in the snow an angel started breathing on the falling flakes so on touching the ground they became the flowers we know, ones to symbolise returning warmth and hope for the world. There is a touch of immortality about snowdrops, the way they come each year (some through tarmac in my garden!) and spread and multiply, without any need of us. Their only enemy – but also good friend – is man. Creating snowdrop woods became another lifetime hobby. On another schoolboy visit to Snowdrop Valley I received a shock. The mansion house had been demolished and the rubble bulldozed down onto the snowdrop bank. The snowdrops were buried. I was so upset I did not go back there for about twenty years; when I did it was to receive another shock: the bank was as white as ever with snowdrops. Investigation revealed why. The buried snowdrops had grown, and even put up white-tipped spears of flower – underground – then, instead of the plant’s goodness going down into the bulb, another bulb was created an inch or so up the stem. Year by year they had fought back determinedly to reach the surface. A snowdrop miracle, take what symbolism you will from it. 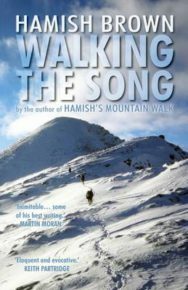 Walking The Song by Hamish Brown is published on 16 March by Sandstone Press priced £8.99.